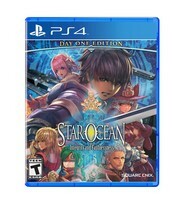 I am thankful Family Friendly Gaming purchased a copy of Star Ocean Integrity and Faithlessness on the PS4 for this review. The plagiarized BSG music welcomed us into this role playing game. Star Ocean Integrity and Faithlessness feels like a Square Enix game. It does not feel like a Star Ocean game though. It takes forever to get into space, and then we still spent more time on the initial planet. The Tales like battles in Star Ocean Integrity and Faithlessness are smooth and seemless. The same goes for the cut scenes. Which is impressive to see. The graphics take a hit for that to happen. The issues families will have with Star Ocean Integrity and Faithlessness is violence, blood, magic, enticement to lust, lack of attire, bad language, graphical glitches, false goddess, demons, can’t save often, and more. Star Ocean Integrity and Faithlessness contains plenty of back and forth travel. It gets boring, just like the repetitive battles. I plan on having a review of Star Ocean Integrity and Faithlessness in the Family Friendly Gaming e-magazine. I think it will make it into issue number one hundred and ten. If not then issue number one hundred and eleven.